When you step into any restaurant or cafe, you want to make sure it looks perfect on your Instagram feed. So, we have made it easy for you to capture gorgeous spots in Koramangala, every time you go out for a meal. 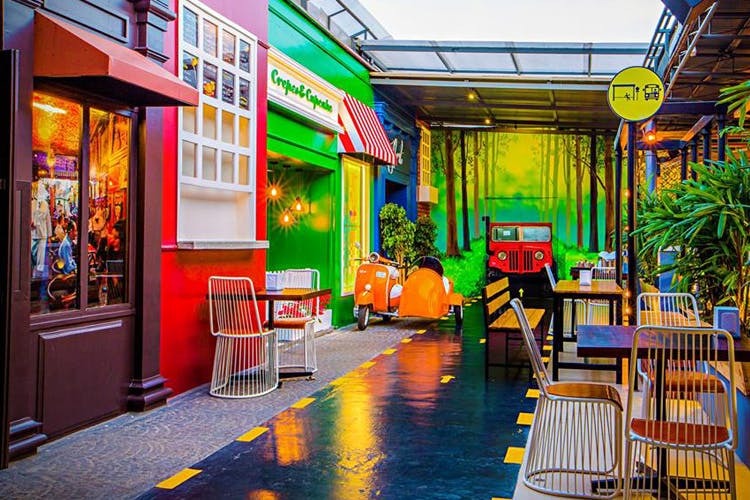 Here are nine of the prettiest or quirkiest cafes and restaurants, in Koramangala that are Insta-worthy! One of the few restaurants that serve vegetarian and vegan food in the city, the deliciously coloured food isn’t not only worth consuming but photographing as well. The alfresco seating in the evening makes it even better! With vivid colours adorning the wall, Crawl Street should be on your list! We especially love the use of green with indoor plants placed at strategic places to brighten up the café both during the day and night. Step in through the wooden entrance to only realise it is just an extension of the bistro’s wooden-themed and minimalistic decor. Brightly lit, shades of brown and grey dominate the colour scheme of this cosy cafe. One section, our favourite, is tucked away from the hustle and bustle of the main road — perfect for date nights or a gossip sesh with the BFF. A picturesque courtyard in middle of the house (typical Kerala Style house) supplying ample light to the entire seating area, the whole café is dotted with books that you can sit, read and enjoy along with lip smacking all day breakfast. Quirky framed artwork, burnt-brick walls, fairy lights in bird cages and wooden ladders used as book shelves make this cafe more than just warm; if this isn’t enough, dig into their satisfying waffles with a million toppings to choose from. A hipster coffee shop you say? That’s definitely a description of this café with asymmetrical wooden furniture, lots of lights and various contraptions to brew fresh coffee. We say, head straight there to get both your coffee and Insta fix! A relatively small, unassuming place, tucked away near Tim Tai, Cafe D’Hide is one of our favourite haunts. With its white-and-green theme, exposed-brick design on the walls and shelves holding small potted plants and jars, the place is pretty enough to lure us in every time we pass by. With motley furniture, brightly coloured lights and a ton of space, this is the kind of place you’ll never want to leave. Adding to the hippy and trippy vibes is the huge mural of the Hippie Baba on one entire wall. Beautifully done, this selfie spot gives you major #DecorGoals and you’d probably want one in your own room. A combination of wood, brick and stone accents around the place, dotted with meaningful quotes to pep up your day, bring out your phones to click away photos of the cafe. If not the ambience, the food is equally delicious and instaworthy. So, what are you waiting for?